If the internet speed of the mobile data on the Samsung Galaxy is a bit too slow, you can change this quite fast! The solution is very simple and suitable for all new Android smartphones, data can be switched to either LTE, or 4G 3G 2G, which is then partially displayed as E, here explained step by step it is so easy like on iPhone! 1.) ... Changing the speed of mobile data on the Samsung Galaxy! 2.) ... What should I keep in mind at the mobile data speed! See also: ► AndroidAP Password for Samsung Galaxy how to change! 1.) Changing the speed of mobile data on the Samsung Galaxy! 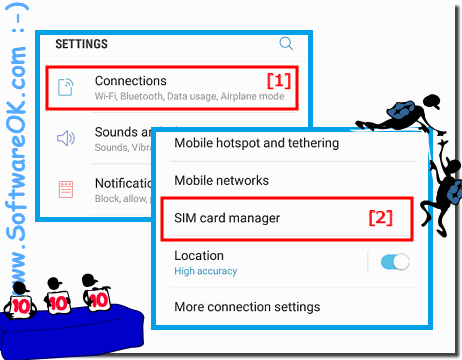 If you want to change the Internet speed of the mobile data, please open the main menu of your Samsung Galaxy, then ► in System Settings select on "Connections" and Select "Sim card manager"
(Image-1) Speed ​​mobile data LTE / 4G / 2G / E on the Samsung Galaxy! There may be issues with setting up your speed, such as a system update to your smartphone / phone, or the peculiarities of public Wi-Fi, or even problems with your wireless service provider, and a simple call often helps. Now you can easily change the Internet speed of the mobile data. (Image-2) Internet Speed and ​​mobile data customize on Android! 2.) What should I keep in mind at the mobile data speed! There are so many public Wi-Fi hotspots, and your phone can randomly access one of them. It will even stay connected without you noticing it in part, after you have come within the reach of a closer, or better range Wi-Fi hotspot. It means that your LTE or 4G will shut down and have a good Wi-Fi connection when overloaded, but in reality the speed is much worse than the mobile data. On Android, or iPhone, you can choose to connect to this public Wi-Fi hotspot when you're within range, using the free hotspots is not always your best bet. Samsung-Galaxy - FAQ-13: Speed ​​mobile data LTE / 4G / 2G / E on the Samsung Galaxy customize?